If you typically purchase the Sunday newspaper for the coupons inserts, there will be 2 inserts in this Sunday’s paper – 1 Red Plum (RP) and 1 Smart Source (SS) insert. 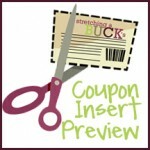 View a list of possible coupons in the 11/11/12 inserts in My Coupon Database. Previous post: Barbie Sisters Cruise Ship Coupon + More Barbie Coupons!